The Saigonese are famous for hopping on their motorcycles and exploring their city at night, and you’ll see everything and anything on a motorcycle here, from families of three (and sometimes four) out for the evening to young love-struck couples on their way to a coffee house to delivery men carrying anything from sacks of rice to bags of goldfish. We join the action riding pillion passenger on restored vintage Vespa motorcycles. Join the biking throng as we explore Saigon’s various districts and soak up the limitless energy of this city, stopping along the way at some of our favourite coffee houses, boutiques, art galleries, street food stalls, minimalist bars and live music venues. Combine this experience with a stay at the upscale Park Hyatt Saigon. A fantastic location in the heart of District 1, the Park Hyatt Saigon mixes colonial accents with luxurious rooms and a stand out restaurant, Square One. Our walking tour of Saigon with a resident expert is also a must, as is experiencing one of the best and most refreshing modern acrobatics shows we have seen, the A O show. Playing at Saigon’s historic Opera House it fuses dance, circus and musical forms in a vibrant and light-hearted series of sketches that track Vietnam’s transition from rural life to urbanisation. Simply sensational. For more information about our incredible Vietnam journey, visit our Vietnam and Cambodia page . 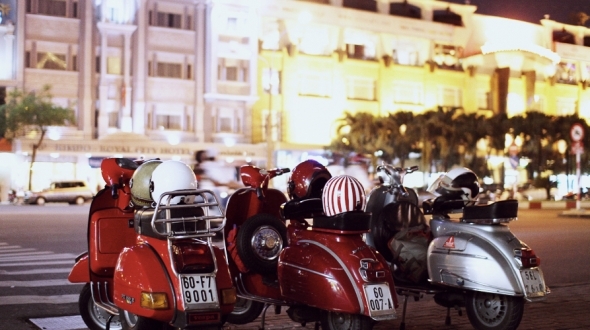 Contact us about including a vintage Vespa experience, or a stay in Saigon, as part of your Seven Skies’ Vietnam experience. As always, we would love to hear from you!